In this section we will go over what a LilyPad circuit looks like and also the types of LilyPad projects you can do. Many of the topics on this page are covered in our Intro to Sewable Circuits Webinar video to the rightbelow. 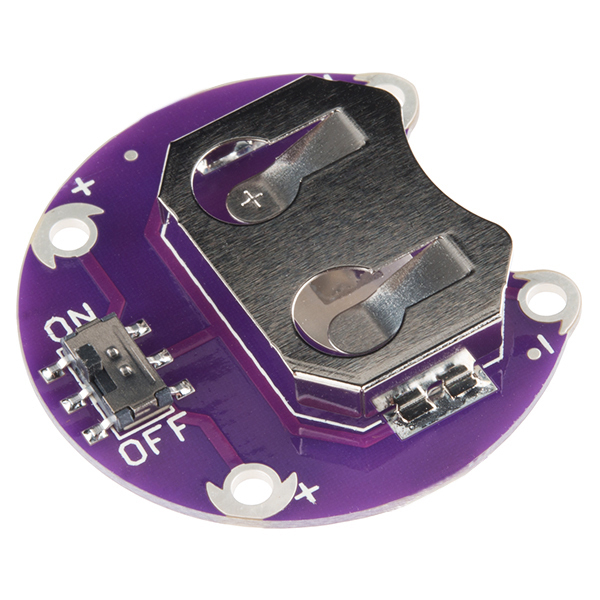 Let's take a closer look into each of the parts that makes up a LilyPad circuit. All LilyPad projects need a power source — most use either a 3V CR2032 coin cell battery or a 3.7V lithium polymer rechargeable battery. Which power solution you need will depend on a few factors: the size of your project, the type of LilyPad Arduino you choose, and whether you would rather replace or recharge a battery. 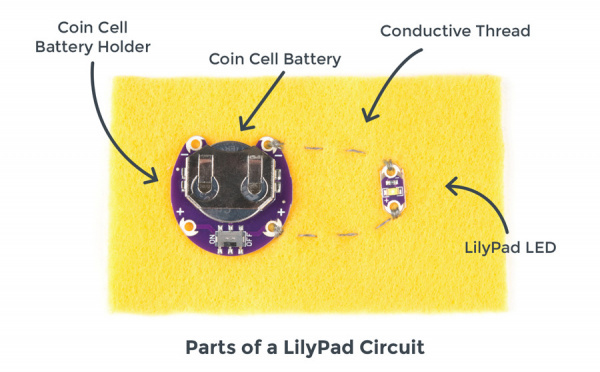 The LilyPad line includes a stand-alone sewable coin cell holder or built-in battery connections for coin cell batteries or lithium polymer batteries (available on select LilyPad boards). LilyPad boards are made to be sewn together using conductive thread, a specialty thread made with stainless steel fibers. 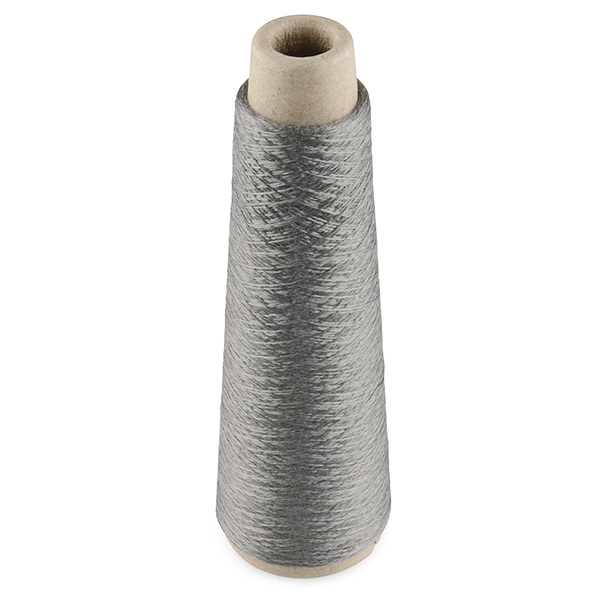 Used instead of copper wiring to connect LilyPad pieces together, it provides a soft and flexible connection between components that is incorporated directly into fabric. Each LilyPad piece has a large sew tab to accommodate a variety of needle sizes for attaching conductive thread. The LilyPad line includes a variety of sewable components for creative projects. Choose from LEDs in a variety of colors, buttons, switches, sensors, buzzers and controller (Arduino) boards. Check out all of the individual LilyPad pieces here. Which pieces you choose to build into your project will depend on your individual vision and goals. Read on for more about the different types of LilyPad projects you can make. Let's dive into each of these categories and direct you to some help along the way. 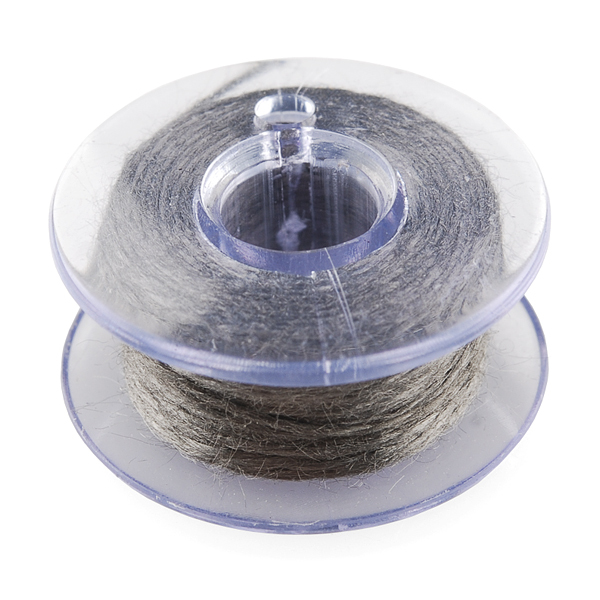 A great way to try out sewing with conductive thread without programming is to create e-sewing projects. 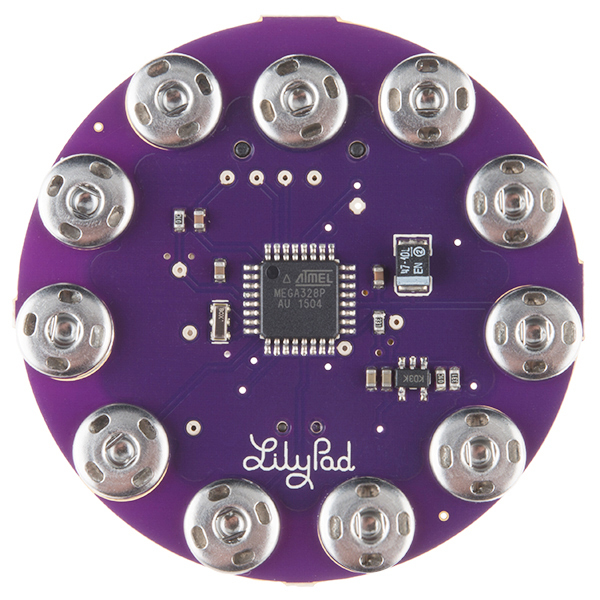 LilyPad LEDs and a LilyPad Coin Cell Battery Holder will light up a project, and the possibilities can be expanded to include simple interactive elements like buttons or switches, which you can purchase or make yourself. We recommend e-sewing projects if you are new to sewing or want to create a quick and easy light-up craft. 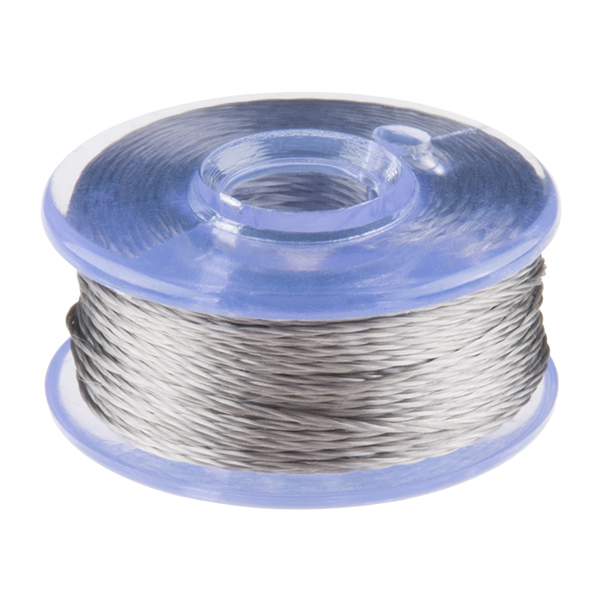 Need more help with e-sewing projects? 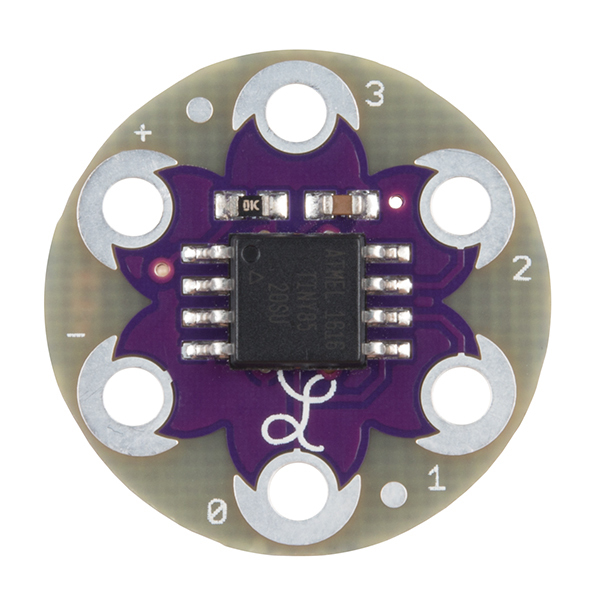 If you are ready to try some flashier effects with LEDs or explore how programmed projects work without writing the code yourself, pre-programmed LilyPad boards are a great option. The LilyPad line includes four products that are project-ready: the LilyTiny, LilyTwinkle, LilyTwinkle ProtoSnap and LilyMini ProtoSnap — just sew and glow! The LilyTiny has a different light pattern programmed for each numbered sew tab. Tab 0 controls a “breathing” fade, tab 1 flashes a heartbeat pattern, tab 2 creates an on/off blink, and tab 3 produces a random fading effect (twinkle). The LilyTiny is a great way to try out different light patterns in a project. If you are looking for an overall sparkling effect on a project, the LilyTwinkle has all four numbered tabs programmed with a random fading effect, mimicking twinkling stars or fireflies. 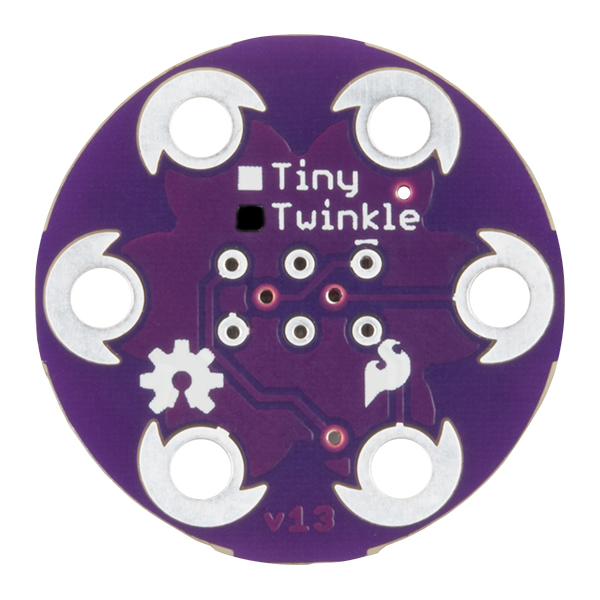 The LilyTwinkle also comes in a LilyTwinkle ProtoSnap, a pre-wired board containing everything you need to test and sew a LilyTwinkle project. 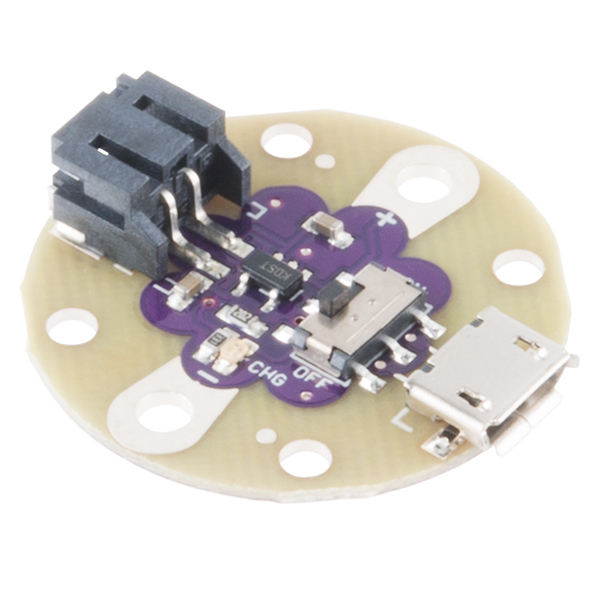 For something more interactive, try the LilyMini ProtoSnap — a pre-wired, pre-programmed LilyPad board with a LilyPad Light Sensor and LilyPad Button attached to it. 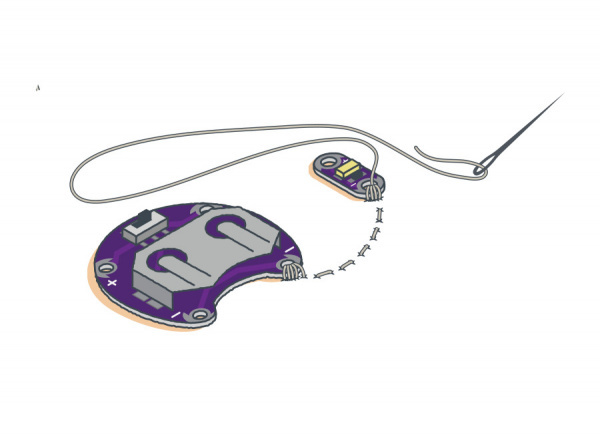 The LilyMini includes a built-in coin cell battery holder to eliminate additional sewing. Test out the circuit with the pre-wired connections, then snap apart and sew into a project. 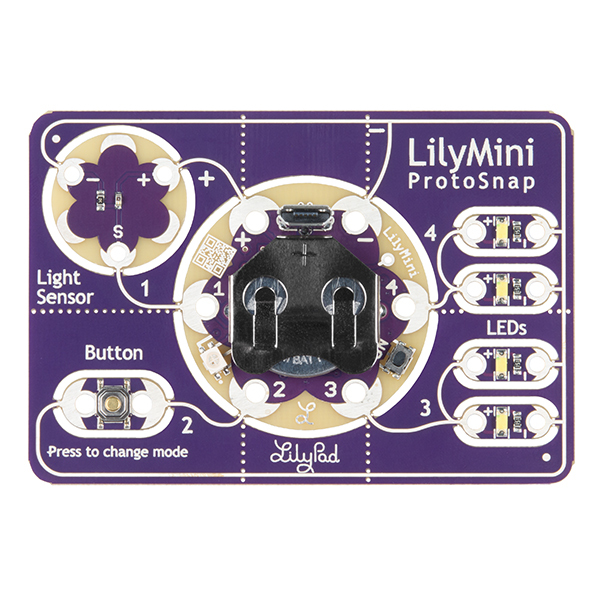 The LilyMini ProtoSnap has three pre-programmed modes (indicated by a built-in RGB LED): white (all LEDs on), magenta (LEDs fade in and out in a “breathing” pattern with speed affected by covering the light sensor), and cyan (when the light sensor is covered, LEDs twinkle). Have an idea for a custom project and ready to program? 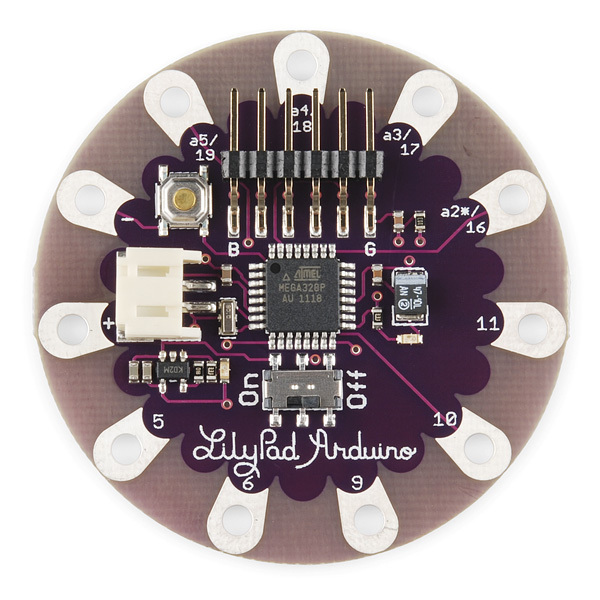 The LilyPad line has a variety of LilyPad Arduino microcontrollers to choose from, all compatible with free Arduino software. 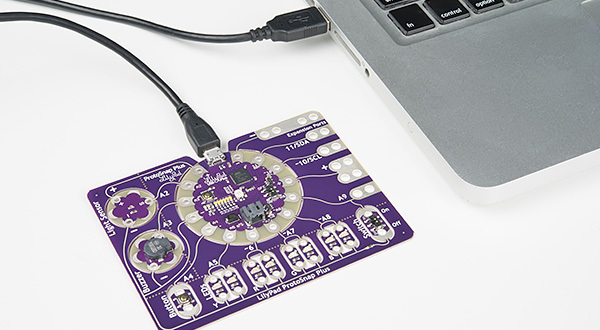 The LilyPad ProtoSnap Plus is a great place to start prototyping a project — it includes twelve LilyPad boards pre-wired to a LilyPad microcontroller for experimenting with code before you sew. 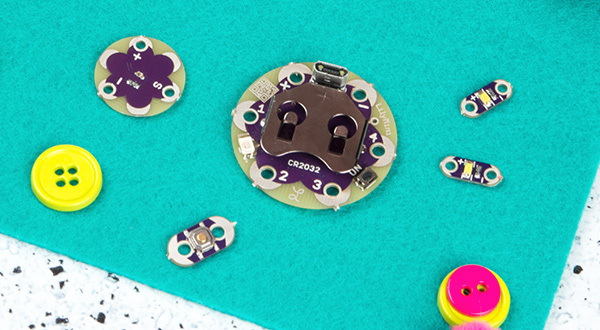 These controller boards can be connected to most of the LilyPad boards for light-up, sound-making or sensing projects. 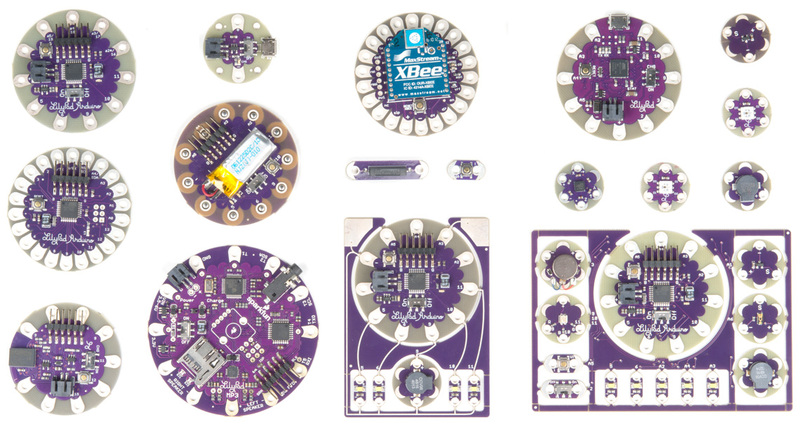 Check out Choosing a LilyPad Arduino for Your Project for a side-by-side comparison of each board’s features. Take a look at our gallery page to browse projects made with LilyPad. Check out Planning a Wearable Electronics Project for tips on brainstorming and prototyping, as well as technical considerations. LilyPad Sewable Electronics Kit — Includes everything you need to make 4 e-sewing projects: glowing pin, illuminated mask, light-up plush and night-light pennant (with LilyMini). Craft supplies also included. 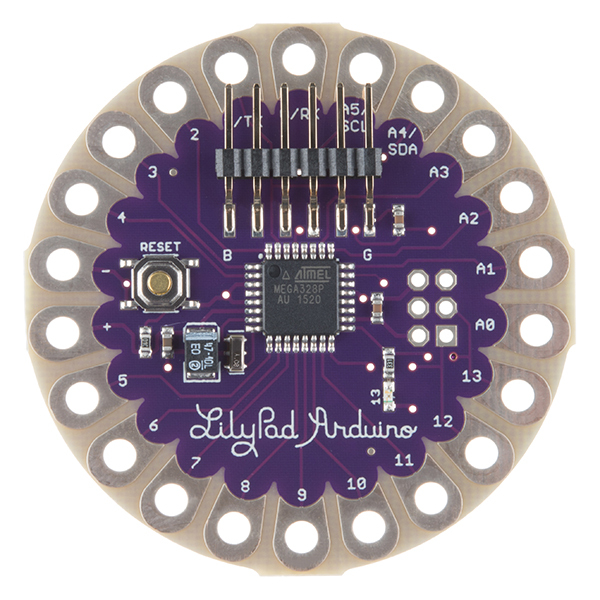 Read some of SparkFun’s blog posts on LilyPad and wearables.